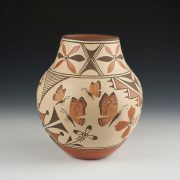 This is a large, hand coiled and traditionally fired vase by Elizabeth and her husband, Marcellus Medina. They do many different designs, but I specifically wanted a piece with butterflies, hummingbirds, floral imagery and Zia birds. This one has it all. Using all classic techniques and natural resources, I couldn’t be more pleased with the work! The painting shows remarkable craftsmanship, reflecting the Acoma traditions. Elizabeth and Marcellus Medina are terrific potters working in Zia Pueblo today. 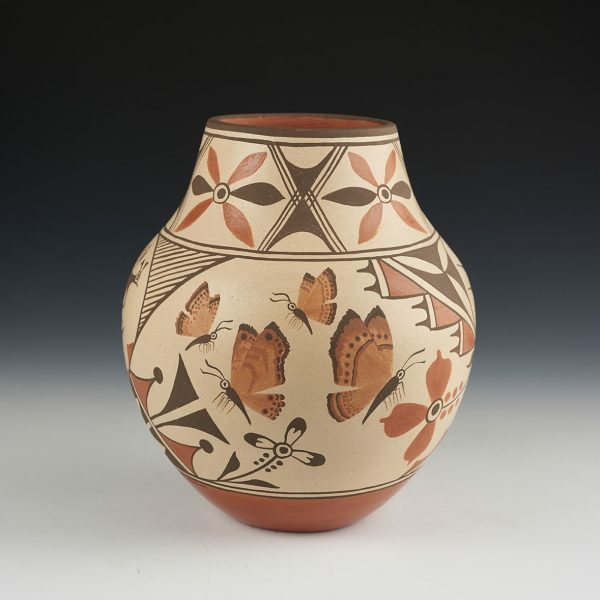 Originally from Jemez, Elizabeth has lived in Zia Pueblo since 1978 and learned the art of traditional pottery-making from her mother-in-law, Sofia Medina. Marcellus (b. 1954) is a self-taught painter who works in watercolors and acrylics. Marcellus is a grandson of Juanita Pino, and a son of Sofia and Rafael Medina. 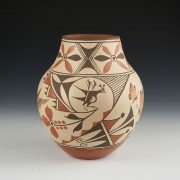 His style is influenced by the work of his uncle, JD Medina. 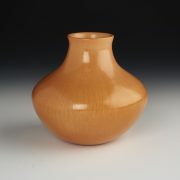 Oftentimes, the husband-and-wife team collaborate to create their traditional pottery. 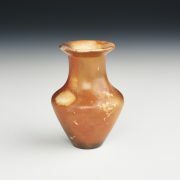 They still collect the natural clays, and mineral and vegetal paints. They also continue to use traditional firing methods. In their pottery collaborations, Elizabeth coils their pots by hand and Marcellus paints the stunning, detailed designs onto each piece. They have received many accolades and awards over the years at Indian Market in Santa Fe as well as other Native art shows.